FOXHANGERS Canal Holidays has announced the winners of its very first Facebook Photo Competition. The company is based on the Kennet & Avon Canal at Devizes, with its competition running throughout the 2018 boating season to celebrate the hire boat company’s 21st year of trading. The top prize of a £1,000 Foxhangers Gift Voucher, went to Lee-Ann Fox for her stunning photo showing her arriving at Bath with her family during a week’s holiday aboard ‘Foxtail’, shown here. Two runners-up will receive a £250 gift voucher each: Simon Carey for his fabulous shot of their journey over the Avoncliff Aqueduct, shown below and Brett Stepto for his multi-generational image of his family enjoying their holiday on the Kennet & Avon Canal aboard ‘Cunning Fox’, shown at the bottom. Contestants were invited to send in photos of their party enjoying a Foxhangers Canal Holiday aboard one of the 18 four and five star narrowboats which have all been built by the Foxhangers Boat Building team. “We wanted to do something special to celebrate our 21st birthday so we decided to run a photo competition. We were absolutely delighted with the response from our customers and we have enjoyed choosing a winner from many fantastic images we received. Foxhangers Canal Holidays offers short breaks (three or four nights) and holidays of a week or longer aboard pet friendly, narrowboats, ranging from boats for two people, up to boats for nine. 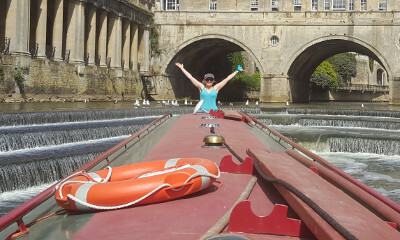 Guests can choose to navigate west along the Kennet & Avon Canal through the quaint market town of Bradford on Avon, over two spectacular aqueducts, and on into Bath and Bristol. Or they can head east up the famous Caen Hill Flight, through the beautiful Vale of Pewsey onto Hungerford, Kintbury and Newbury.